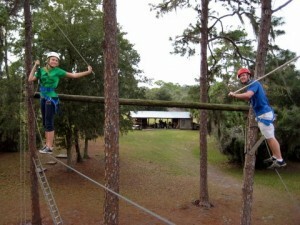 A narrow walkway in the sky that provides participants with a great introduction to High Ropes Elements. Two climbers assist one another to ascend a colossal ladder into the trees. The Tower is composed of a vertical obstacle course, a simulated rock wall (pictured at right), and a Zip Line. 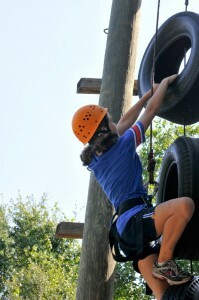 Participants on the ground provide advice as climbers scale the vertical playpen or climbing wall. 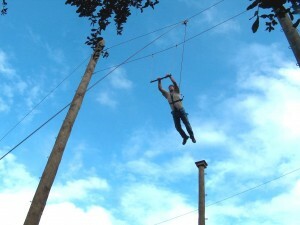 As a reward for their hard work, climbers can ride the Zip Line to the ground. After ascending to the top of a utility pole, participants gather their courage and leap for a hanging trapeze. 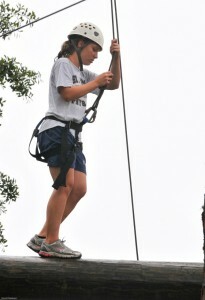 They must put complete faith in their belay team on the ground if they hope to reach their target. Each of these elements challenges participants to make their way across a horizontal foot cable while using ropes to maintain balance. On the 2Line Bridge, participants hold on to a horizontal hand rope as they traverse the foot cable. On the MultiVine, participants move between hanging vines. The further the participant gets, the farther apart the vines become. 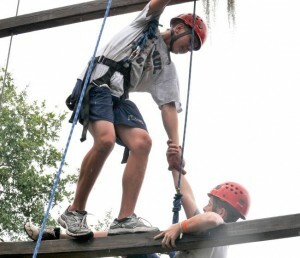 For information on how our High Ropes Elements foster teamwork, check out our Team Building on the High Ropes Course page. 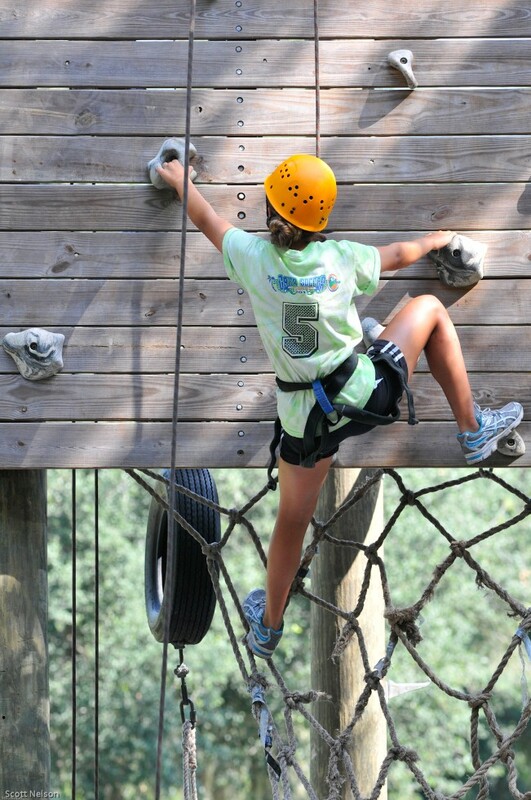 For pricing information for your own High Ropes Program, fill out our Program Pricing Request Form online. I loved what our kids did! It did a great job of revealing the areas we struggle in but at the same time they overcame them. We enjoyed it very much and we have played together better since then.